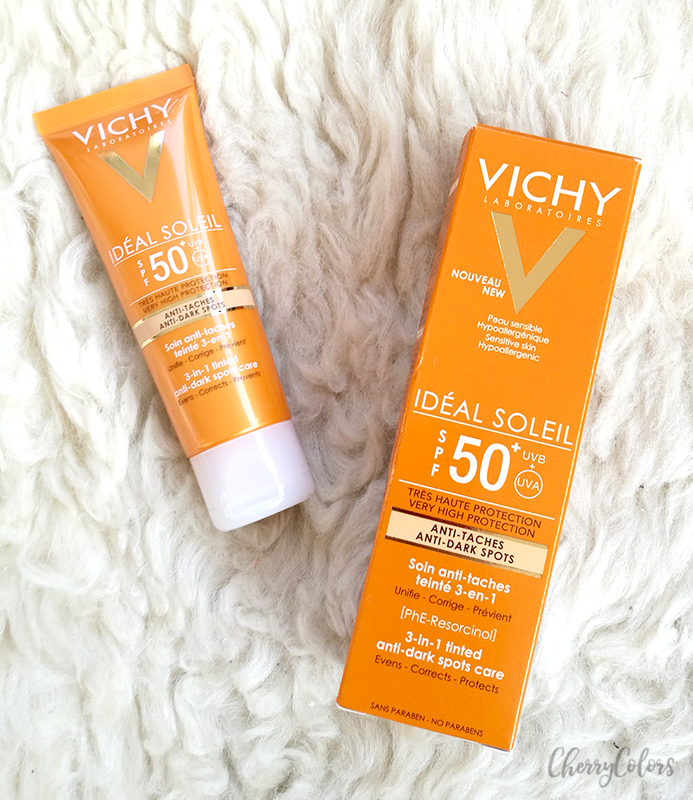 Vichy IDEAL SOLEIL 3-in-1 Tinted Anti-Dark Spots Care SPF50+ - Cherry Colors - Cosmetics Heaven! You know I'm all about sun protection, right? Even in the middle of a cold, freezing Winter. Yes, even then. That's because sun rays damage our skin even after the colder months of the year. And well, most of the colder months I'm using an active product and I'd need a good sunscreen anyway. I believe in using sunscreen all year long. Even if it's Winter the sun is still shining and causing pigmentation spots or making worse your PIH or PIE. Unifies instantly thanks to universal mineral pigments. Correct dark spots day after day thanks to its pigmented/colored formula enriched in Phe-Resorcinol, an innovative active ingredient against spots and protects from UVB/UVA rays. PARABEN FREE. Hypoallergenic formula tested on sensitive skin under dermatological control. Enriched with Vichy Thermal Water : soothing, fortifying and regenerating. 19.2% of the spots are reduced after 8 weeks of use. Enhanced protection to the UVA long. 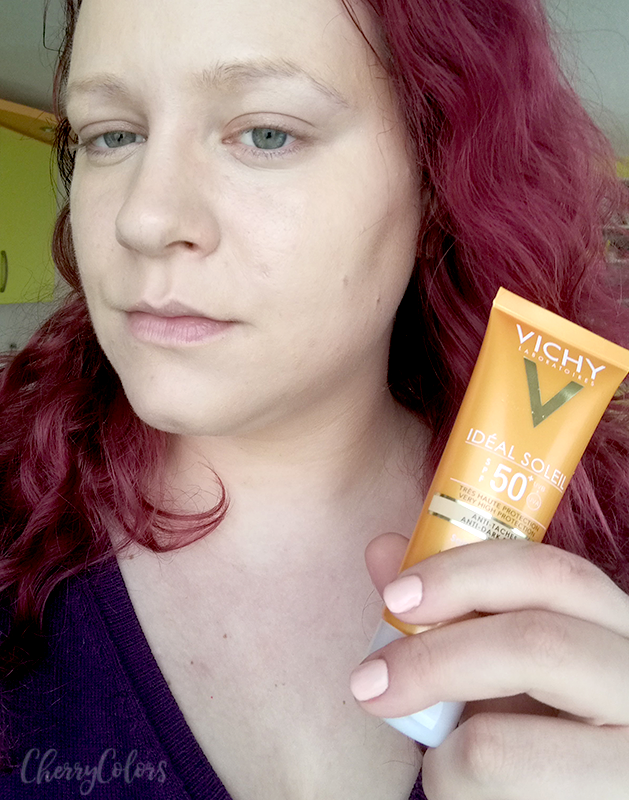 The Vichy Anti-Dark Spots cream is actually a tinted cream with high SPF (50). I love good sunscreens and if they are tinted and still offer a high protection from the Sun, then I'm all a fan of them. 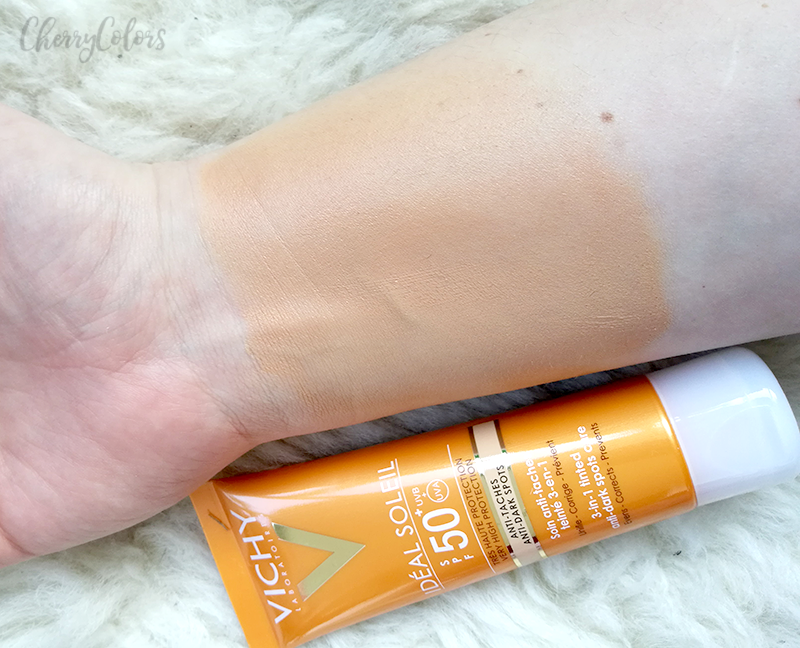 Sadly the Vichy Tinted Anti-Dark Spots cream doesn't offer a variety of shades since it comes in one shade only. As you can see it leans on the orange side (the horror!) which becomes even more obvious when spread. I don't get it. Who are these too-dark-too-orange colored things for? Oompa Loompas? I'd totally understand it if it wasn't orange but it would have more of an olive tone, then yes, it would be wearable for lots of people (just not us Snow Whites). Of course, I had to test it on my face too since I'm already writing a post about it. The cream was easy to spread, but it did start to dry quickly. I had less than a minute to spread it evenly on my face and neck. Once it was dry it had a matte finish which was unexpected. When I looked in the mirror - shock - I looked really orange. But I decided to wait it out since lots of creams kind of adapt to your skin after a couple of minutes. After 10 minutes, the picture below was the result. As you can see, it doesn't look all that bad anymore. I still looked a bit tanned, but it wasn't as shocking as before. 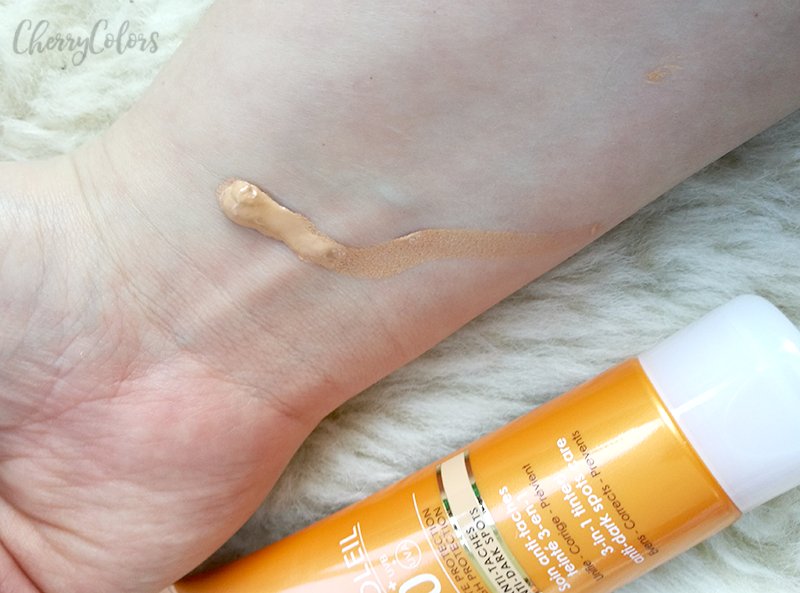 The cream has a medium coverage, and that is awesome considering it's a tinted sunscreen. Sadly it does apply streaky if you have dry patches because it's ultra mattifying. So I'd say it's only useful for combination or oily skin because this product is way too drying for other skins. I didn't like the effect when I looked up close because there were lots of uneven patches on my skin. + it's a tinted sunscreen if the color matches you can go out without a foundation! I know there are many people who would benefit from this product. 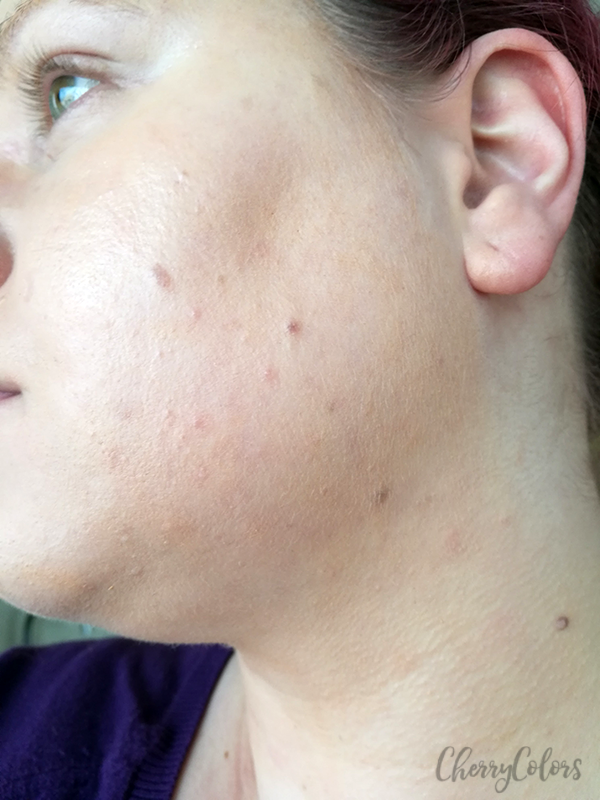 Like those that would like to incorporate a sunscreen in their regime but don't know where to start and hate the feeling of regular sunscreens. Well yes, then this product would be a nice starting point (if only the color isn't too off). I'd suggest getting a sample of this sunscreen before purchasing it because even if it does get lighter after application, I do feel that the fact that it comes in one shade only, makes it appealing to medium to darker skin tones only. So, is this product a YAY or a NAY? Well, for me it's NAY because of the color shade. If it were a regular sunscreen I'd be all over the place!